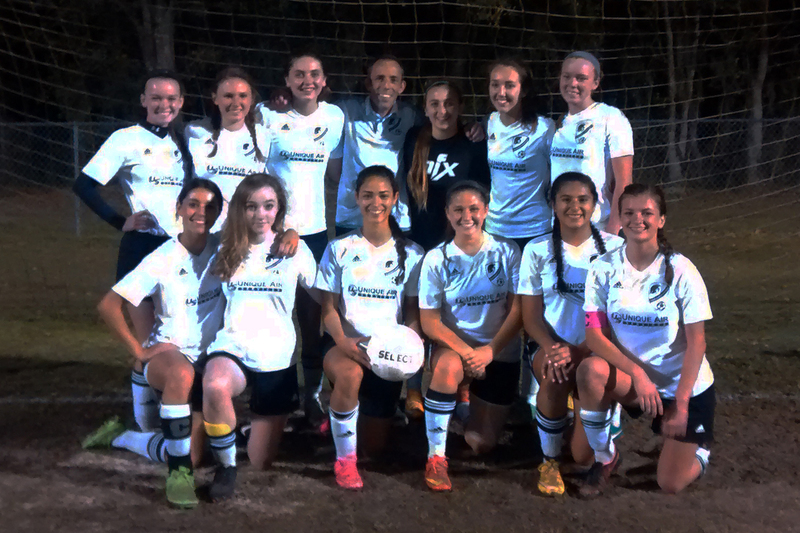 The Sarasota Spartans u19 Girls team | Paul Fullylove - Soccer Schools - This site is Under Construction. The Sarasota Spartans u19 Girls. What a season! I have had the privilege of managing/coaching many squads of various ages for many (very many!) years now and have been lucky enough to have seen the transformation of many new or struggling teams succeed. This year was no exception; at the beginning of the season a quarter of last year’s players returned and the other places were filled… we had a team, just! Our first training session was filled with nerves, shyness but above all a realization by a coach that in fact he really did have a TEAM! Now keep in mind this under 19 team also had players of just 16! Within a few training days everybody’s playing position was set along with those fantastic players that every team needs that can play anywhere and everywhere (often these players are over looked but should realise they are invaluable to the coach and a necessity to the team ). Every player was obviously different but in so many ways, some very sure of themselves, some confident, some shy but all, and I really do mean all, had an amazing ability to learn, take instruction and most importantly put the skills from the training ground onto the field. We even had players that played positions and formations that were new and alien to them, but they listened, they learnt and they trained. They really trained! Without complaint, with dedication, with professionalism and most importantly with fun and a smile on their face they worked and put their trust in themselves, their team and a strange coach from England. Our first game came along very quickly, an away game against a team called Heartland Chargers SC, a team that we didn’t know anything about, at all! What did I say before the game, I couldn’t tell you! I’m sure I would have said, “stay in formation, play your position and trust in your team mates to do the same and work on the strategies we’ve trained for” or something similar followed by one very important thing, “believe in yourselves!” The Coach was sure his team was not only good, but a lot better than everybody thought it was going to be, even the players! He knew one thing for sure, they had the heart and soul it takes to play this game. We won, not only did we win but we won 5-0, half the players walked off the pitch looking happy, half in shock. But that strange English coach that played an odd formation knew he had found a set of players that excelled. Football or Soccer as it is here is, as they say, “The Beautiful Game”, it’s also hard, tough, painful and challenging, as any contact sport is. Some people forget that a true coach cares about his players and views them as heroes in so many ways. You get to know them as people and personalities over the months and they each become part of you and all have proved they have the courage it takes to play this beautiful game. Every single player on this squad is a credit to their Families, the Club, there Coach and most importantly themselves. They are a true team and an inspiration to all. They have all gained my respect in so many ways. As the season progressed we won a solid 70% of our games, some of which were more battles than games, but battle they did. We arrived at our last league game yesterday evening after a two hour drive ready for a 7:00pm kick off. The floodlights were set, the referees ready and a beautiful Florida evening temperature. We had one substitute, a plan and played. We won 3-0. All that is left to say is thank you, to the on-going support of the forever dedicated parents and my team. I am an incredibly proud Coach, it has truly been an honor, thank you.